I genuinely love making clothes for my 3 sons. From the time they were little guys tossing around my fabric scraps on the floor while I sewed, seeing the joy on their faces as I finish a new garment is something that will never get old for me. So often they love picking their own fabric and planning out various aspects of each project. Working with them has always been part collaboration, and it's wonderful to see design through their eyes! 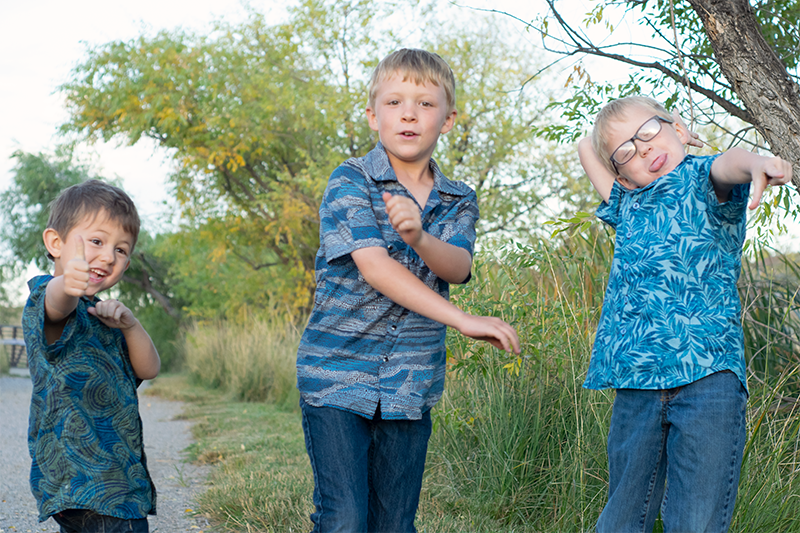 I knew that these Hawaiian cotton lawn prints would be the perfect opportunity to do just that with my boys. Let's talk about the fabric, the pattern, and what you can do to make awesome button downs for the tiny men in your life. Hello again Fabricistas! 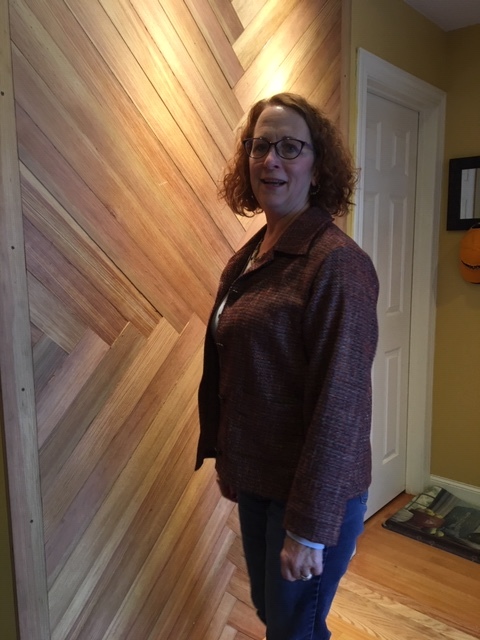 It is time for the next post in our Fabricistas Explore series! 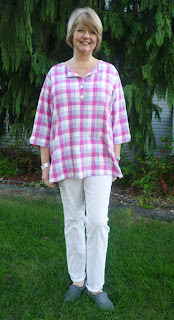 Today we have bloggers Sue from Ilove2sew & Ann from SewBaby News. They have each chosen a pattern from the our newest pattern company arrival, Cutting Line Designs. If you missed Part One, make sure to head over & read that too! But make sure to come back & finish Part Two! since that was a new-to-me company, I jumped all over it! 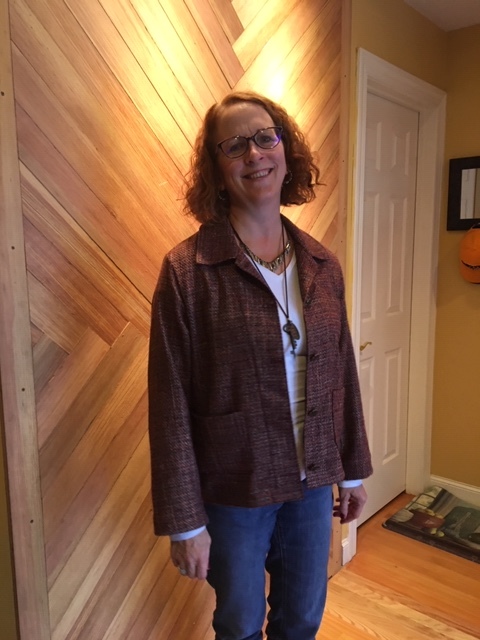 I choose the By Popular Demand pattern as I loved the styling of the boxy jean jacket. I’ve always wanted to make a jean jacket style with a boucle fabric and that’s what I did. This fabric is a wool blend from the designer section from FM and I simply love the feel and colors in it. There are still a few yards of it in stock. You can find it here! While it is a blend, it took a lot of heat from the iron, with no ill-effects, so I believe this to be nearly 100% wool. For the instructions on this pattern, they were great! This was like a sewing lesson to put together this jacket. Everything was well-explained and illustrated. I just love it when I don’t have to think too hard! I did add one simple step and that was to add stay-stitching to the neckline. I think this is important. I was so wondering how this collar would turn out with the unusual cut and design of it. The upper and under collar are cut as one piece, thus eliminating bulk at the collar edges and giving such a gorgeous result! I plan on using this technique in the future by adapting other jacket patterns from other companies as this is pure genius! I don’t have any dislikes with this pattern. There are some fun details, which are a little difficult to see since I used a darker, textured fabric. For my design changes, I eliminated the top pockets. There’s nothing wrong with them, I just thought that with my choice of fabric, it looked like more of a barn jacket than a jean jacket, not what I was going for! I took this in quite a bit. 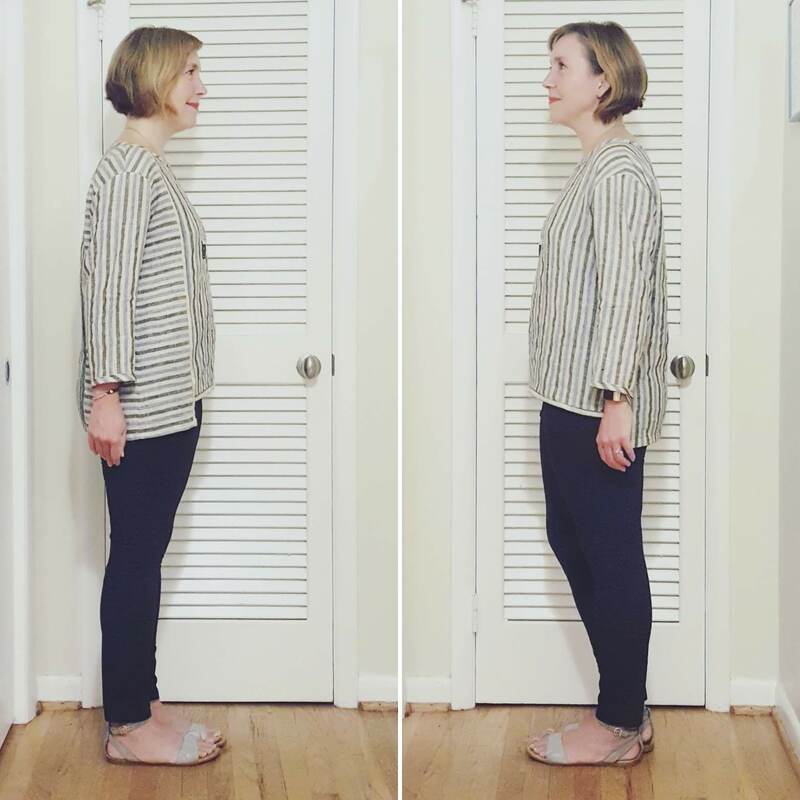 My measurements put me in the medium range, but during my mock up, O felt like I was swimming in it! I took it in quite a bit so it’s basically a small size. On the inside, instead of finishing off the edges with serged or zigzag edge, I make a Hong Kong finish with a cotton quilting fabric. I love Hong Kong finishes! I would sew this pattern again and hope to make this jacket in a denim since that’s what would show off all the fun details the best. 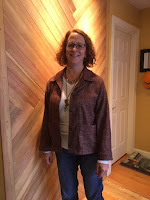 I do recommend this pattern to anyone who wants a great and fun jacket pattern! 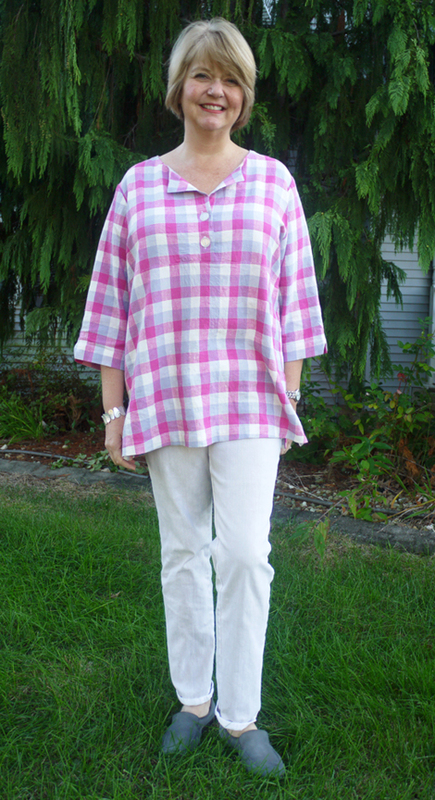 A Pink, Grey and White Checked Linen/Cotton Blend Shirting. Found here. Linen is a good choice for this style. Yes, they were very detailed, and I actually learned some new things about clipping neckline seam allowances! The designer uses a lot of edgestitching which results in a very professional finish. What did you like or dislike about the pattern? 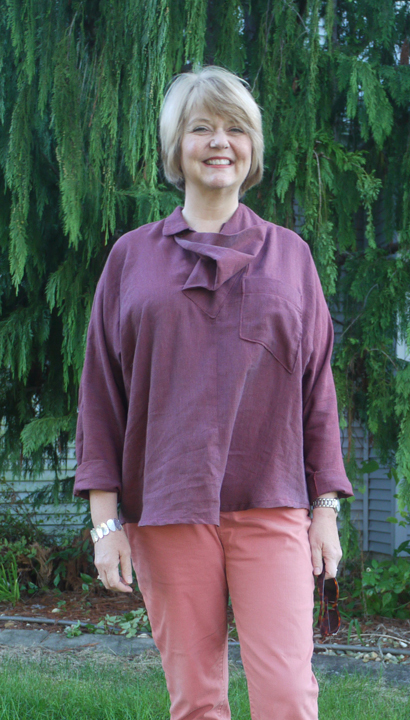 I liked the ¾ notched sleeves, and the collarless neckline of the Ebb tunic. It’s very simple and wearable. Did you do any pattern alterations or design changes? No, I made the size that fit my measurements without changing anything. It feels a little big. I might size down next time. For my checked fabric, I worked hard to match the pattern. 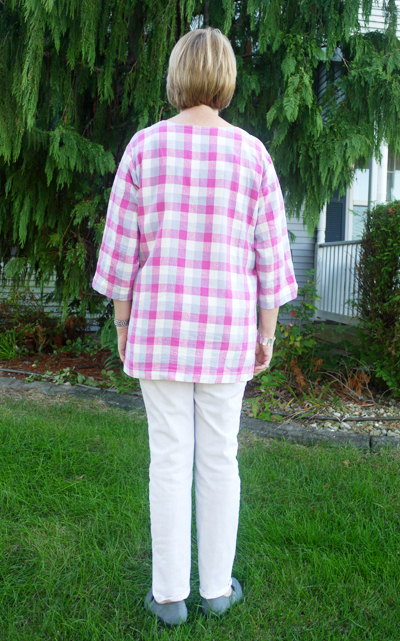 I could see doing some interesting combinations of fabrics, making the yoke and back out of coordinating fabrics. Yes, I like this style- it’s very versatile. Any other comments about the pattern? I also made the Flow version out of a brushed gauze fabric. Unfortunately, my results on this one weren’t as good. The fit was odd on me, and the collar doesn’t look like the illustration. I probably will not make that view again. But, I do like the Ebb version enough to recommend the pattern! 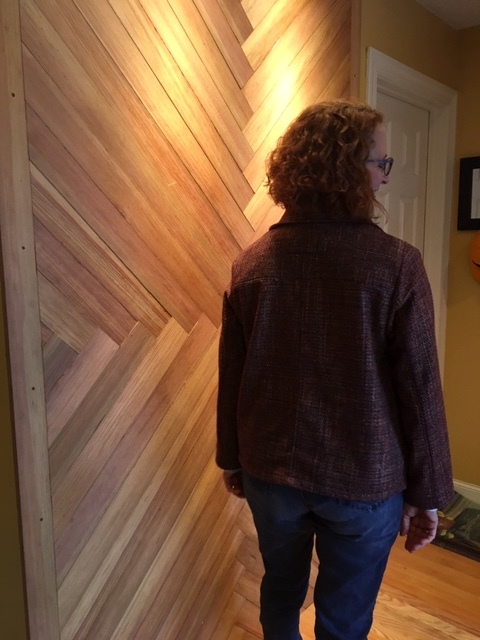 Have you ever been wowed by an inspiration look on Pinterest or Instagram and vow you will find a pattern or learn how to make it? I was super excited when I came across a look on Instagram that I knew I could make and selected this beautiful deep denim blue linen fabric to create this month's look. PERFECT for layering during Fall and WINTER! Over the past few months, I have spent more time advancing my sewing skills and learning more about what fits my body type. I am in love with wide leg pants, classic tops, and pieces that I can rock more ways than one. 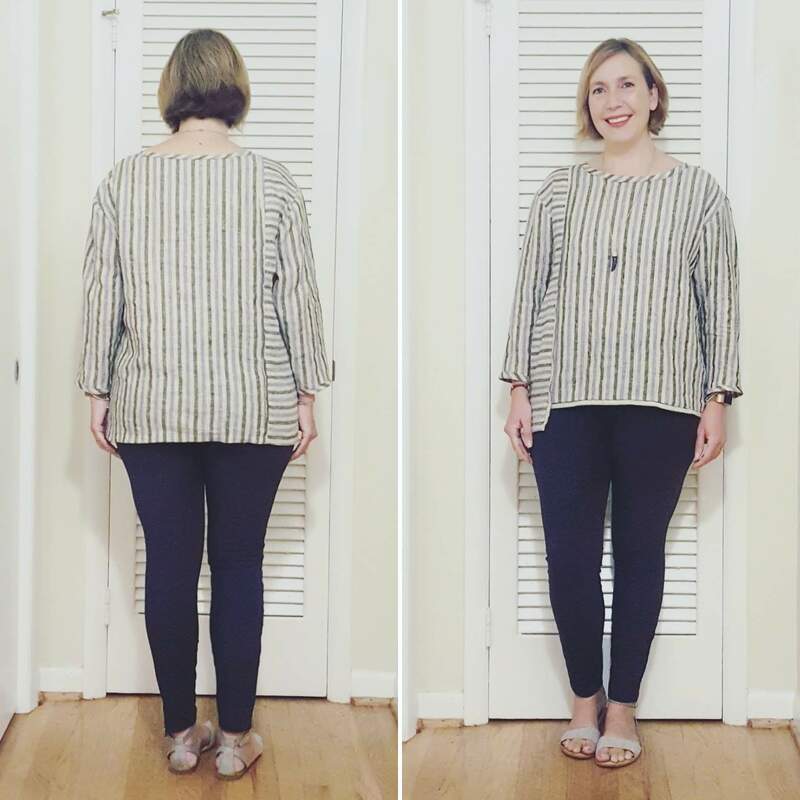 Made by a Fabricista: My 3 versions of the Sinclair Skylar Knit Hoodie! Hi everybody, it's Virginie from Jazz Couture and I hope you're doing well! 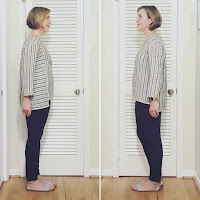 On the blog today I'm showing you 3 interpretations of the Skylar Knit Hoodie (Sinclair Patterns). 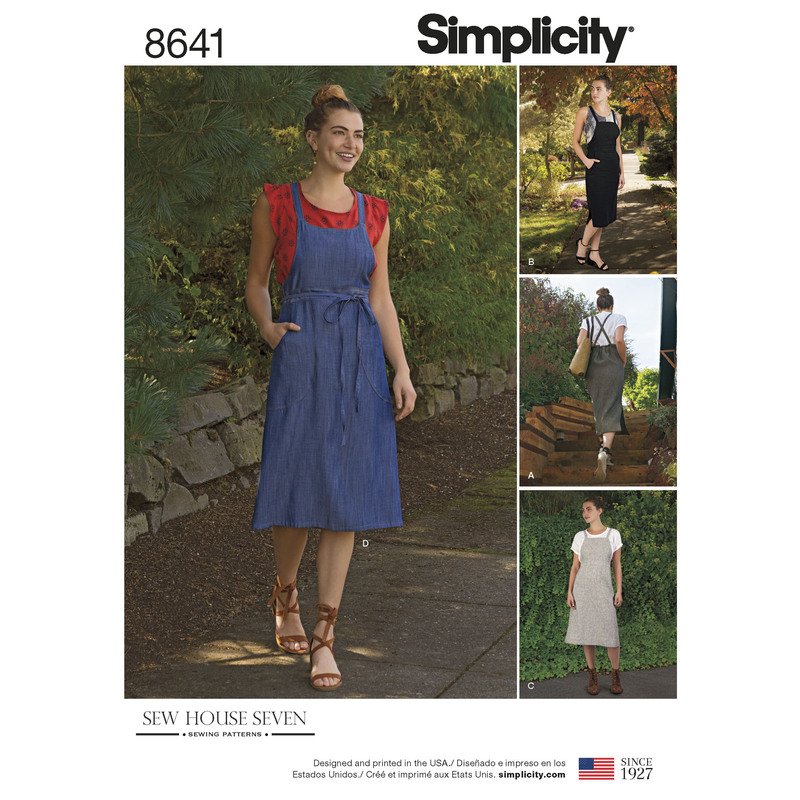 A while ago I selected some knit fabrics and I had envisioned wrap dresses, tops and maxi skirts. Well, Sinclair Patterns just released the Skylar Knit Hoodie and that totally changed my plans. I decided to go with my instinct, I bought the pattern and made 3 hoodies in a row. I'm so glad I did, they're just perfect for the changing weather we have here in eastern Canada! Welcome to the very first post in our Fabricistas Explore series. Today we have a special two part blog post for you! 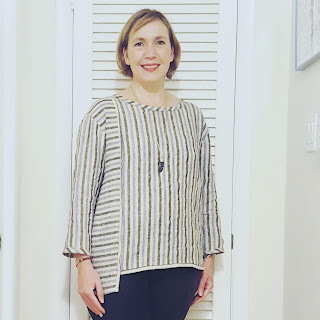 We have selected four of our lovely Fabricista Bloggers to try out patterns from Cutting Line Designs, the newest pattern company added to our store. Today we have bloggers Dina & Marica. Make sure to check back Monday 10/22 for part two with Ann & Sue! I loved that they were so very detailed, but to be honest, they were SO detailed that I was a bit overwhelmed at times at the sheer amount of information. I think a beginner will be appreciative, however, some of the explanations were a bit clunky, so if Cutting Line is interested, I think a sewalong (online or a video) for these patterns would be wonderful for a sewer who might like a bit more handholding. I especially liked how they clearly marked when to use what seam allowance. It was also marked on the patterns themselves. I dig that there are two different shirt patterns in one package. I love the simplicity of the box top and the definitely more intricate design features of the this or that top. It is like, "Hey, I'm going on a trip, let's make one fancy top and one top for tooling around town in..." Very ideal for people who like to tackle two projects at once, but only can stomach so much intricacy in design and need a simpler design for one of the projects. I feel like the designers were very careful with their measurements and it translated to a very easy time when applying the bias trim to the neckline and sleeve hems. That is a mark to me of a very well though out pattern. 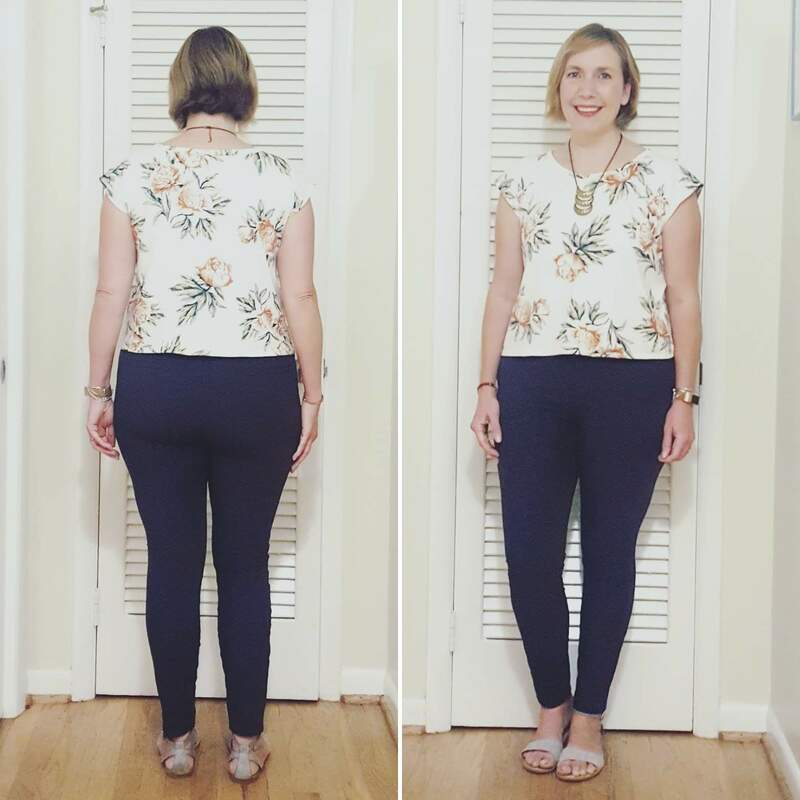 I had to grade from a small to a medium at my hips in the this or that top. I may need to bring the stairstep hem on the top as I am not sure the longer length in the back and side with a shorter front hem flatter my frame. I think it is super pretty as is on my dressmaker dummy, but on me, meh. 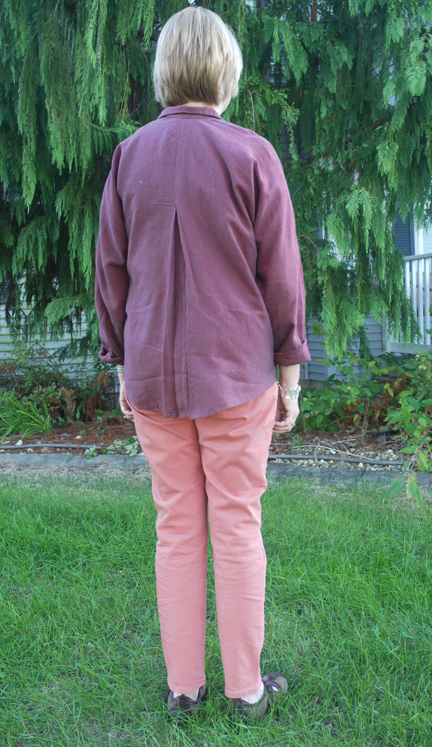 I did tack it up with the hem all even and it looked really nice, so I may do the alteration sooner than later. I did really like the box top on me, and it fit well right out of the package, with NO alterations necessary on the x-small/small size! Yay! Would you sew it again? I would! I think the unique design on the this or that top is very interesting and the fact that you can play with color-blocking or stripes (as I did) or different patterns or textures makes it a winner. You also can never go wrong with a top that takes no time at all to sew up like the much less involved box top they offer with this pattern! The instructions were well written and very detailed. The steps were easy to follow and any beginner would understand the instructions. My only issue was I did not read carefully for the facing and assumed the pattern required two pieces. I spent about 10 minutes trying to figure it out realizing that the neck facing is just one piece. I also at first did not understand pressing the interface towards the outer piece and realized after. It still turned out just fine. I love the pattern after making it. The only issue, I would have graded the small to the medium from the waist down based on my body type. Did you do any pattern alterations or design changes?I did NOT make any alternations to the pattern but will the next time around and grade between sizes from the waist down. Any other comments you'd like to add about the pattern? 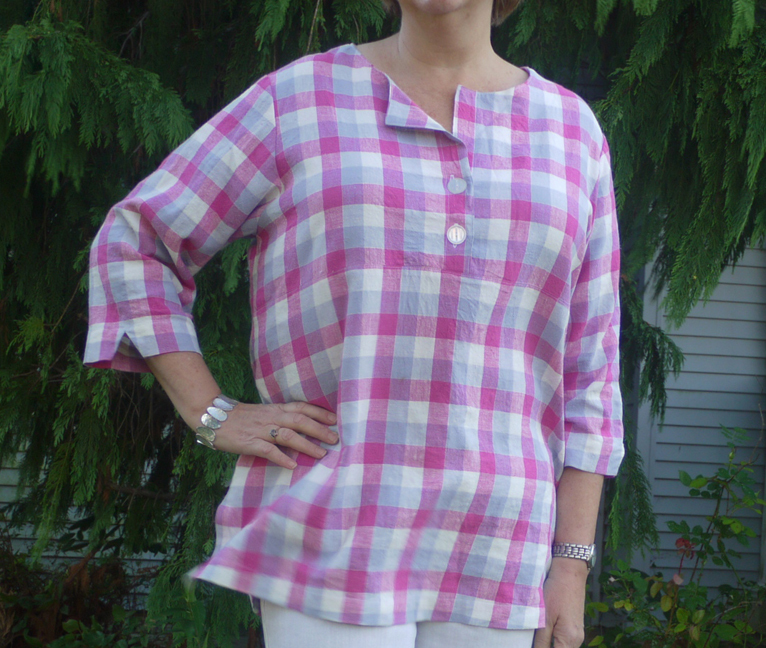 This is a classic top and I plan to make this using a sturdy knit such as a PONTE knit during the fall. The instructions were well written and very detailed. The steps were easy to follow and any beginner would understand the instructions. I love the pattern after making it. 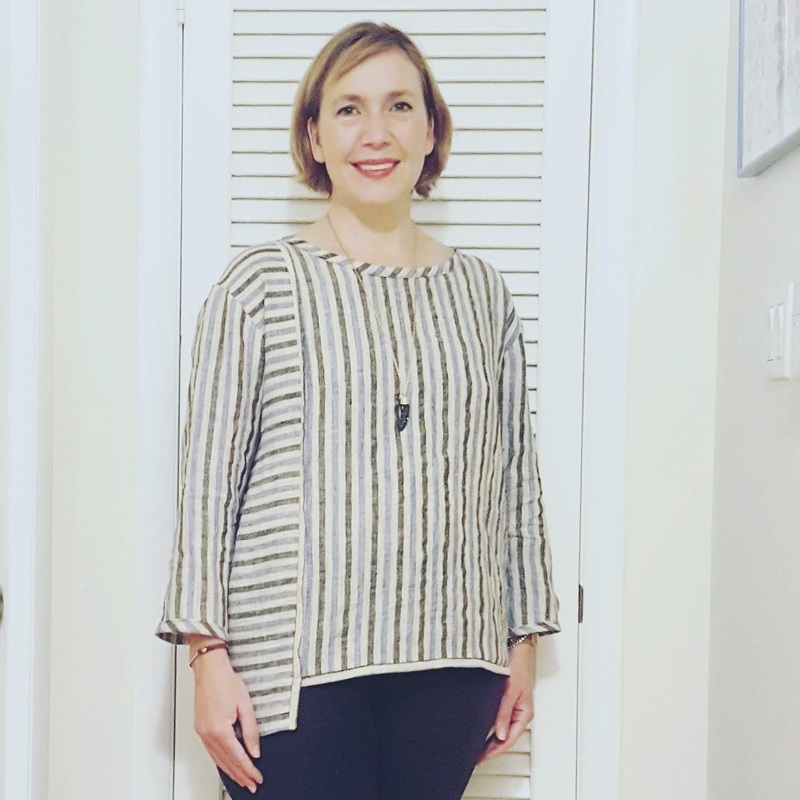 At first, I was skeptical about the cowl neck but after sewing it up, I fell in love. I did NOT make any alternations to the pattern. I honestly felt for this view, I would lengthen it by about an inch the next time around. 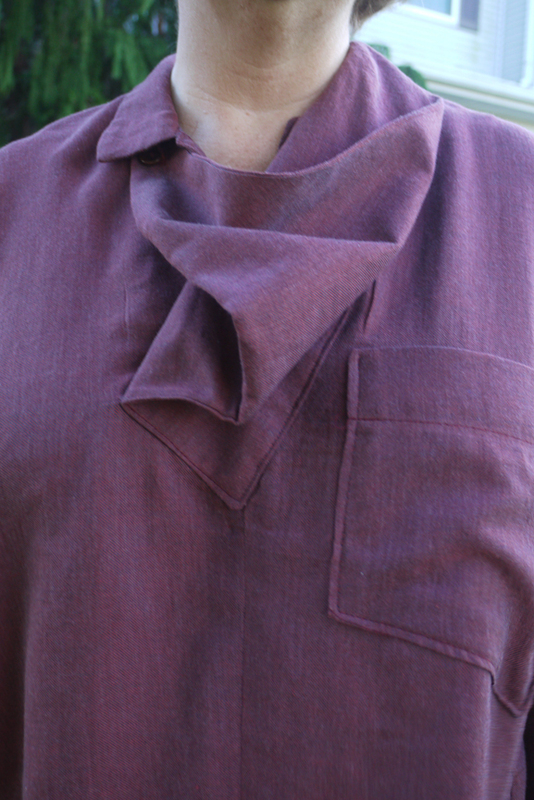 For the cowl neck, linen is perfect and drapes beautifully. Every fall my girls begin to complain about the excessive air-conditioning in their school and begin to request a new zip up jacket. This year I was ready for their requests with the Jalie Charlie Bomber pattern and some gorgeous pink scuba and lovely thick ponte, all courtesy of Fabric Mart. I recently read a book about the Finnish concept of "Sisu". What is Sisu? It's a unique word to Finns that describes their nationality personality- one of perseverance, determination and resilience. And how do you get Sisu? Well, this author had many suggestions, including walking in the forest to reduce stress and anxiety. I thought, "I can do that!". She said that 90% of Finns say that they go to the forest on a regular basis. I don't know about you, but with all that is happening in the news lately, I've been feeling a little more stressed than I want to be. You're probably wondering- what does this have to do with sewing?? Well, a friend and I decided to take up Nordic walking in the forest, and I felt that my neon bright, high tech, polyester workout wear was completely out of place there! I felt like a fish out of water. So, I went on the hunt for some natural fibers in some forest shades that I could make for walking in the forest. I found this abstract linen/cotton print that reminded me of old driftwood, moss and berries. Perfect! Although this particular print is no longer available, I think many linens would work, as well as anything in the Shirting section.